After the research stage, we start our conceptual work given our clear assessment of the fundamentals of the project’s technical requirements. Utilizing everything from old-school pencils and markers to high-end digital touch-pads, we create sketches using state-of-the-art Wacom Tablets, brainstorming and free-associating to create as many sketches as needed internally until presenting to the client the best and final concepts. In this stage we define functions, choose appropriate physical effects as working principles for the given functions, consider the major form parameters linked to the effect, and sketch principle solutions. 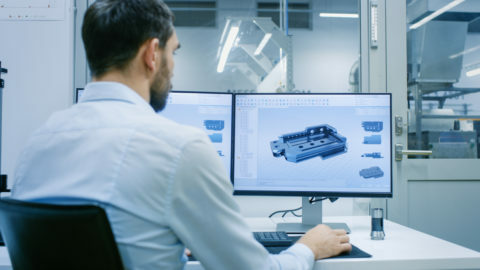 Dedicated manufacturing facilities allow a rapid transition from inspirational concept to real-world prototype once a product idea has been designed and engineered. As the product design emerges, 123’s Project Manager uses the now well-informed assessment of product specifications to present to the client a detailed list of all the materials, sub-assemblies, intermediate assemblies, sub-components, components, and parts that will be needed for the manufacture of the final product. Using mathematical techniques to break down a physical structure into substructures or “finite elements,” interrelationships are then converted into equation form to mathematically analyze and solve mechanical issues such as stress resistance and displacement while minimizing weight and expense.